Focused on the natural, built, and cultural layers that make Toronto a rich urban environment, the Myseum presented ‘The Weight of History’. 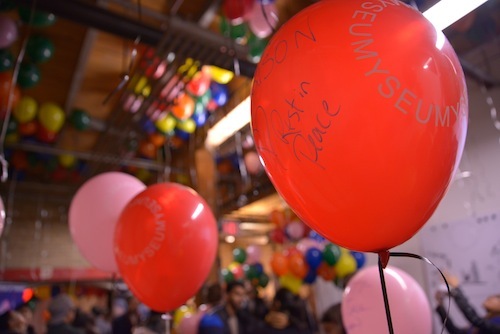 Participants were asked to label balloons with pivotal and controversial moments in Toronto history. They added or removed weight from the balloons, depending on whether they considered them as thematically heavy or light. The balloons continually rose and fell creating a visual installation in the freight elevator at 401 Richmond.